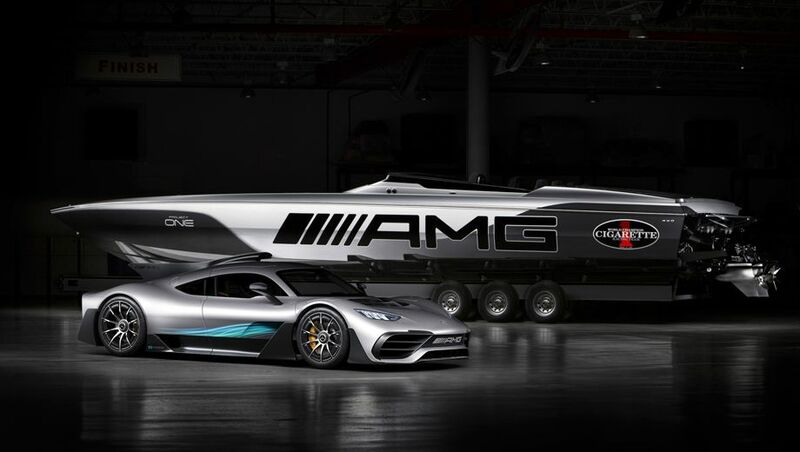 Think of Mercedes-AMG's US$2 million '515 Project One' as a supercar for the sea. This needle-nosed racer packs 3,100 total horsepower and can hit a top speed of 140 miles per hour. 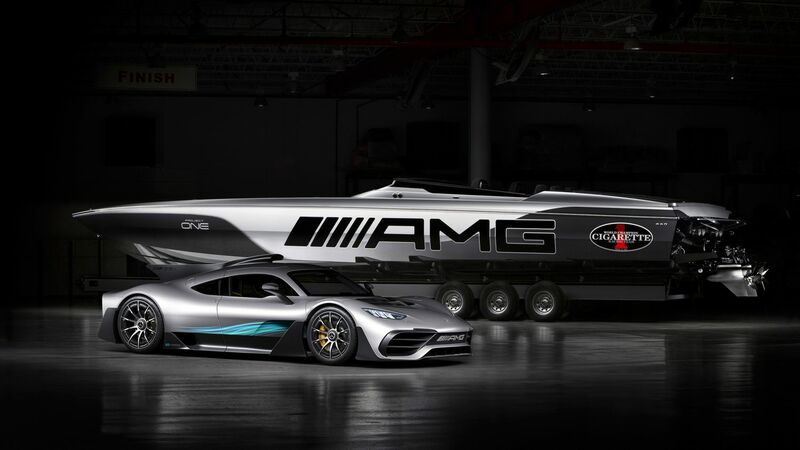 The look and color scheme of the boat is based on the Mercedes-AMG Project One hybrid supercar developed from Formula 1; it’s the fastest, most advanced boat Mercedes-AMG and Cigarette Racing Team have produced in their 11-year partnership. In past years, they have paired multiple cars with cigarette-style boats, which are long, narrow crafts made for speed. 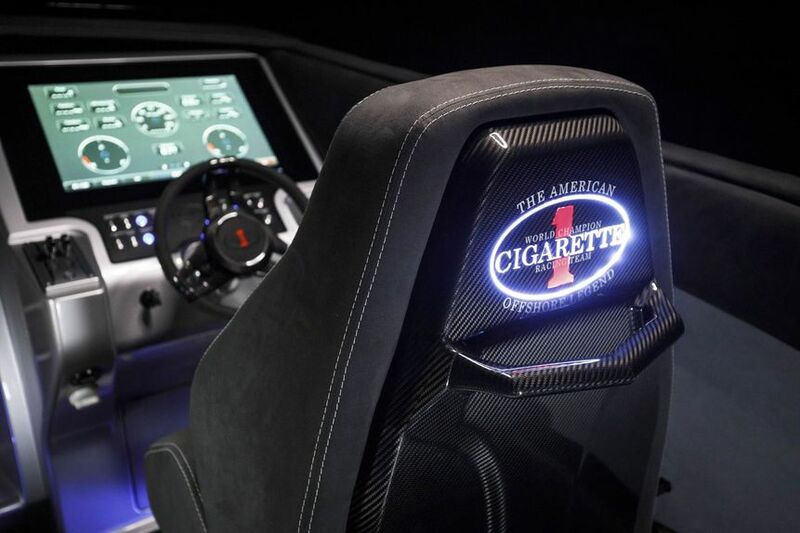 These include the SLS, the G-Wagen, the Vision GT Concept, and the GT S. The partnership works mainly to buoy each brand’s image and, for Cigarette Racing, as a research exercise to develop engineering for use in other boats. 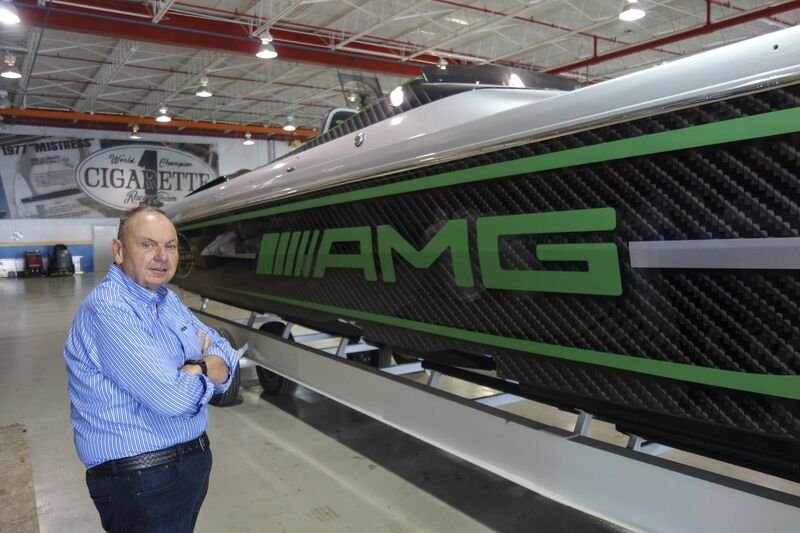 The $2 million racing boat, next to its inspiration, the Mercedes-AMG Project One hypercar. 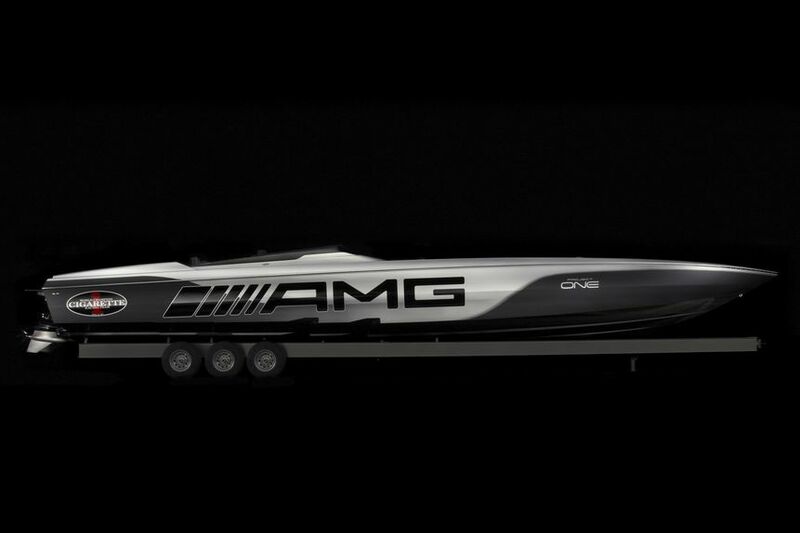 Project 515 is faster and proportionally lighter than the preceding AMG-Cigarette boat, the Marauder, which was 1,300 pounds lighter than its own predecessor, even though the latest boat is bigger and has more seating. At 51.5 feet long and 9 feet, 6 inches wide, it weighs the same as the 50-foot Marauder but seats an additional passenger (six total) and offers 30 percent greater surface area. It’s more advanced than any of the nine previous AMG-paired boats Cigarette has produced, featuring a totally new deck and hull composition and different weight balance. This is a far cry both from the cigarette boat’s predecessors: the original “rum-runner” boats used during Prohibition to out-run larger vessels and the 1960s-era “go-fast” boats designed for offshore racing (and drug smuggling) across the Caribbean to the United States. Rum-runner and go-fast boats were characterized by a deep V-shape, 20- to 50-foot hull length, and a renowned capacity for speed. In dry dock, the Project 515’s extreme deep-V shape is even more apparent. The bulkier Marauder, which cost US$1.8 million, was considerably more volatile under high speeds. This one is far more stable, says Cigarette Racing Chief Executive Officer Skip Braver – the crucial thing when you’re battling six-foot waves on the open ocean. That’s why Braver bought the company in the first place: Anyone can make a boat go faster, but it takes real engineering prowess to make it stable. “I was tired of getting the crap kicked out of me in other boats,” Braver tells Bloomberg this week at the Cigarette Racing factory 20 minutes outside Miami. He bought the 49-year-old company when it was facing bankruptcy in 2002 and has since developed it into a 68-person operation producing 40 hand-built boats a year. Chief Executive Officer Skip Braver, in Cigarette Racing’s Miami factory. Project 515 is powered by a pair of Mercury Racing engines that produce 1,350 horsepower apiece when activated by a special “Race Key” fob and when racing fuel is used. A separate “Pleasure Key” fob will operate the engines at half-power with 91 octane fuel. Cruising range under a calmer setting such as, say 75 mph, is 538 miles. 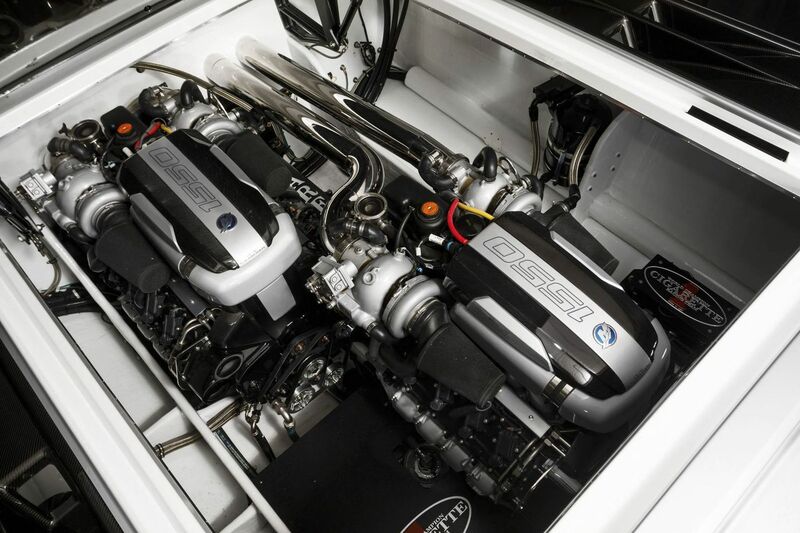 The boat runs on two Mercury Racing 1,350-horsepower engines and M8 stern drives. 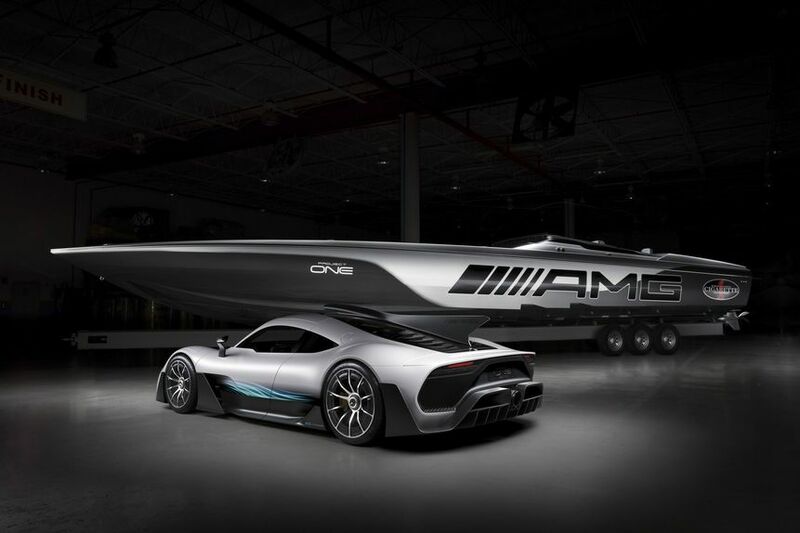 While Mercedes won’t actually place an AMG engine in this boat, the vessel bears significant similarities with the Project One supercar: carbon-fiber construction, massive power, and a set-back cabin with a long front end. Inside, six bolstered seats are covered in exposed-weave carbon fiber and Garmin computer systems. They blend with the exterior AMG-designed, matte black and silver paint and special badging that matches the Mercedes-AMG Project One. The new boat comes with seating for six. 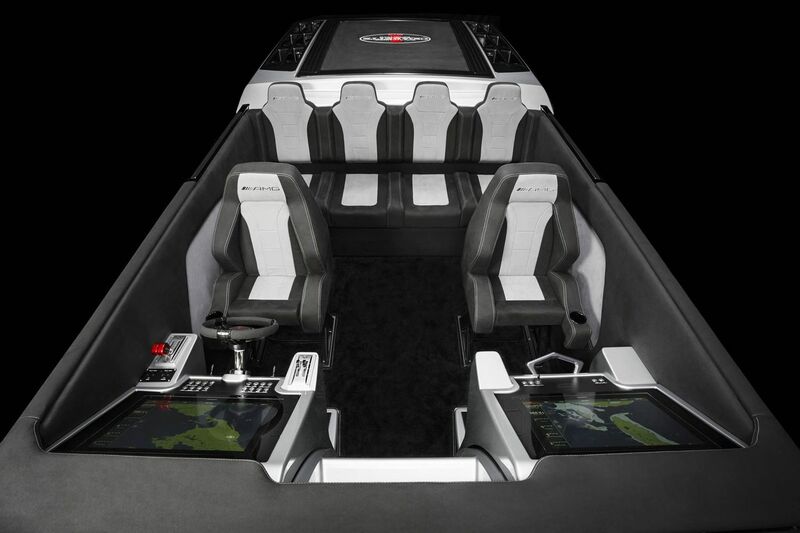 The key to the smooth ride of the 515 Project One is a special cutout section along the hull of the boat, which creates a cushion of air and water that - combined with the placement of the control center, power-to-weight ratio, and low hull– make it feel stable at high speeds, say Cigarette representatives. 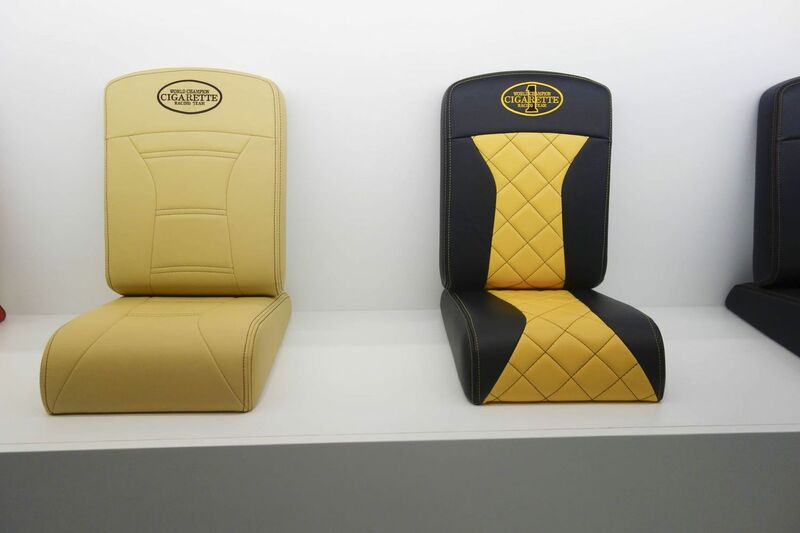 Customized seating options at the Cigarette Racing factory. What they see through that window is more about small, incremental changes than a single, flashy leap forward. 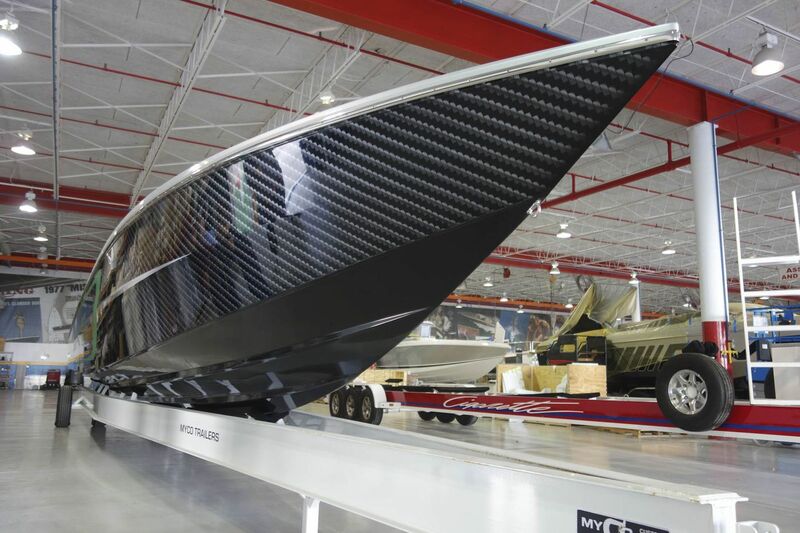 There’s ever more carbon fiber: As with autos, the boat’s impressive speed and incredible weight savings mostly reflect that its deck and many components – including the hull, bulkheads, and engine hatch – are made from the material. “Carbon isn’t the answer to everything, but it is the secret sauce,” Braver says. The boat comes equipped with Garmin products and customizable interior and exterior trimming options. In addition to the carbon fiber, the most significant engineering change, says the designer, was to lower the vessel’s center of mass for improved stability and cushion at high speed while leaving the “aggressive shoulders” at its rear untouched. 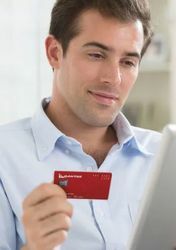 This allowed the large sun cushion to be flush with the hatch as well, which maximizes the space available for crucial things one does on a multimillion-dollar pleasure craft - such as lounge.